Do you have a need for skilled workers and have difficulties finding resources? Are you already involved or planning to start skills centers/training programs to secure sustainable business operations? Do you work with skill development as part of your CSR program? Many Swedish companies are involved in training and skills development in India, either as part of their business operations or through community development. From the Business Climate Survey, we know that lack of skills continues to be the top challenge for companies in terms of their workforce. Holistic sustainability is a core value of Swedish companies; economic, environmental and social. It is part of Brand Sweden and something we want to strengthen going forward as we work collaboratively within our network and with India, in order to contribute positively to the development of this country and its people. This has been discussed amongst the Board of Directors of SCCI and taken up as a strategic key area and we invite you now to explore and discuss how we together can impart skills to ensure employability with a holistic perspective. We will next meet on Friday, March 24, 11:00-15:00 hours (incl. lunch) at SCCI Office in Delhi with a focus on exploring Public - Private Partnership setups with the help of IKEA. 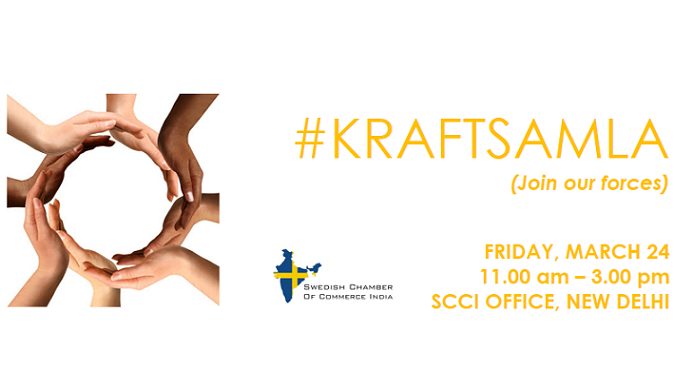 Venue - SCCI Office, C/o Business Sweden - Business Sweden, Nyaya Marg, Chanakyapuri, New Delhi. Following this, we will gather for a discussion on April 26 at the same time and venue.